Temple Grandin Equine Center’s director joins Horses and Humans Research Foundation’s scientific advisory council. Wendy Wood, Ph.D., OTR, FAOTA has become the newest member of the Horses and Humans Research Foundation’s scientific advisory council. Wood is a Professor of Occupational Therapy and the Director of Research of the Temple Grandin Equine Center (TGEC) at Colorado State University. The TGEC is dedicated to advancing the science of equine-assisted activities and therapies (EAA/T) and evidence-based education in EAA/T. 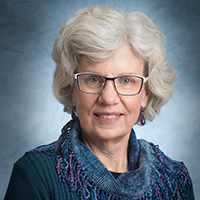 Dr. Wood is currently leading a team of graduate students in conducting a systematic mapping review study of all refereed papers on EAAT published over the past 35 years. Findings from this study will help to guide the research and education agendas of the entire field of equine- assisted activities. Dr. Wood is also a research mentor to undergraduate, master’s level, and Ph.D. students interested in equine-assisted interventions for children and adolescents with autism and cerebral palsy, at-risk youth, and older adults with Alzheimer’s disease and related dementias. She is an internationally recognized scholar and leader in occupational therapy, and was recognized as one of 100 influential people in the profession's first 100 years in 2017, the Centennial Anniversary of the American Occupational Therapy Association. Her work at the TGEC has brought together Dr. Wood’s love of horses with her dedication to developing evidence-based interventions that improve the everyday functioning and well-being of people with disabilities and other life challenges. The Horses and Humans Research Foundation (HHRF) funds rigorous, scientific research that advances global knowledge of horse-human interactions and their impact on health and wellness. According to HHRF executive director Ken Boyden, JD, EdD the board is in the midst of planning focused direction for the research they will support in the coming decade. Dr Wood’s work and knowledge will be vital in guiding this visioning and planning process. Dr Wood commented that "I embrace the mission of HHRF not only because it thoroughly fascinates me; but also because it is dedicated to advancing a science of the mutual flourishing of people and horses alike."